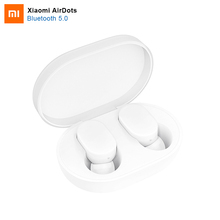 A couple of months bank Xiaomi launched their true wireless earbuds, the Mi Airdots and it got sold like hot cakes. It costs around $50 on sites like Aliexpress and is one of the best selling gadgets. But looks like Redmi (now a sub-brand of Xiaomi) has launched their own version of Redmi Airdots with Bluetooth 5.0 and it costs about as low as $15 (Roughly Rs. 1,000)!! Xiaomi has recently launched their new budget smartphone Redmi 7 with Snapdragon 632 in China. The device has HD+ display, dual rear cameras, 4,000 mAh battery and a lot more. Apart from the smartphone, Redmi also launched their new Washing Machine and Redmi Airdots. These truly wireless earbuds are equipped with built-in Realtek 8763 chip, which is really rear to find at this low price tag. As we’ve mentioned earlier, these earbuds come with Bluetooth 5.0 technology and they are provide TWS (True Wireless Stereo) experience. Each earbud weighs around 4.1 grams which is super light-weight. The design of Redmi Airdots is almost identical to the Xiaomi Airdots. However, these come with a black color this time. These can give you up to 4 hours of playback time in stereo mode and around 5 hours of backup in mono mode. The 300 mAh charging dock will allow you to use it for up to 12 hours. These wireless earbuds have been launched in China and there is no confirmation about its arrival on India as of now. These cost CNY 99.9 (Roughly Rs. 1,000). You can order them from Chinese stores soon.